The panel members are managers working for decision-making bodies, port administrations and hydroelectricity operators; they are also government representatives or acknowledged experts in disciplines essential for understanding all the challenges of rivers: hydrology, climatology, urbanism, anthropology, archaeology, the sociology of religions, environmental engineering, etc. Our different panellists have been selected for their expertise and areas of influence. The decision to entrust the chair of the panel to Erik Orsenna is based on the observation that the general public knows little of river environments, since they are often considered as industrial tools approached from technical and scientific angles. Through its association with such a writer and storyteller, IFGR wished to make the subject more accessible. Erik Orsenna has written numerous works on economic topics aimed at the general public (a collection devoted to globalisation, with “The future of water” in particular). Vice-President of the Argentine subsidiary of the Ibero-American Maritime Law Institute (IIDM) and the legal affairs coordinator of Hidrovias Latin America. He is a lawyer specialised in maritime law and a consultant working on behalf public and private clients, on questions relating to port and navigation infrastructures, and to the environment and coast. The Ibero-American Martime Law Institute (IIDM) was founded in 1995 in view to developing and harmonising maritime law in South America. It is composed of different government and port authorities, companies, legal practices and specialists on navigation from more than 20 countries. Historian, Associate Professor of the Ecole Pratique des Hautes Etudes (Religions of Southeast Asia). He is a specialist in the religious and cultural history of Vietnam (19th – 20th centuries). He contributes in particular to project studies on hydropower developments in the Mekong delta and on the development of a river civilisation by linking historic archives and field studies. The Ecole Pratique des Hautes Etudes (EPHE) is an internationally acknowledged higher education and research establishment whose mission is to educate students through practice in fundamental and applied research devoted to a vast range of disciplines. Archaeologist, Director of research at CNRS, Director of the French-Syrian Archaeology Mission of Al-Rawda, and a member of the laboratory “Archéorient. Environnement et sociétés de l’Orient ancien” of the Maison de l’Orient et de la Méditerranée (MOM). A specialist in the pre-classical Middle East (Bronze Age), her research covers different subjects relating to the river societies of the Middle East: Urbanisation in Syria-Mesopotamia, the first towns / Habitat and urbanism / Religious architecture / Human adaptation strategies in steppe regions / Nomads and sedentary populations on the arid margins of the Fertile Crescent. The Maison de l’Orient et de la Méditerranée (MOM) was founded in Lyon in 1975 to bring together several research teams working on Mediterranean civilisations, from the first steps of humanity to the present. Doctor of Anthropology; Deputy Director of the Research and Education Department of the Quai Branly Museum. Graduated from the Ecole Normale Supérieure of Paris and holder of a post-doctoral degree from the University of California in San Diego, one of the world’s leading research centres specialised in the Pacific, he is the author of several scientific publications and a book titled Physical Cultures, Rugby in Samoa published in 2014. A museum of non-Western arts and civilisations inaugurated in 2006, the Quai Branly Museum exhibits 3,500 works of art from Africa, America, Asia and Oceania. Vice-President of Operations of the Montreal Port Administration. Daniel Dagenais has more than 25 years’ experience in the maritime industry (operator of bulk terminals, containerised and non-containerised goods). He holds a degree in specialised transport and logistics management from McGill University and a finishing studies diploma for acting managers from the HEC. The Montreal Port Administration (APM) is an autonomous federal agency responsible for managing the Port of Montreal. It built and maintains the installations that it rents to private companies for tying off, and operates its maritime station and railway network. PhD and researcher with the Australian National University; member of the Australian National Committee on Water Engineering; specialist in water governance and participatory procedures. Katherine Daniell has worked in France, Australia, Bulgaria and the Pacific on projects linked to water governance, risk management, community resilience, urban development, adaptation to climate change and international scientific and technological cooperation. She has written many publications and received different prizes and distinctions for her work. The Australian National University (ANU) is a national research university located in Canberra, specialised in the challenges facing Australia and the rest of the world. Architect, founder and director of Urbia-Group – Think Beyond. Bernd Gundermann has more than 30 years’ experience as an architect and urbanist. In particular he was head architect for the Centre of Hanseatic Trade of Hamburg in the framework of the largest port transformation project in Europe (the Harbour City of Hamburg). He is the author of a large number of works on specific coastal developments relating to the effects of climate change. His philosophy is based on adapting urban actions to the natural environment and points towards innovative areas of exploration such as crossing bio-mimetics with indigenous spirituality. He received the Global Award for Sustainable Architecture in 2014, under the aegis of UNESCO. Urbia Group brings together varied scientific disciplines, designers, economists, philosophers, political representatives and civil society, and operates as a consultancy in strategy, urban development and the design and construction of public and private projects. President of the Bangladesh Inland Water Transport Authority (BIWTA). Educated at the Naval Academy of Bangladesh, and at a large number of international professional education institutes (United Kingdom, Pakistan, Canada, Australia), Commodore Md Mozammel Haque has been active in the Bangladesh navy since 1982. He participated in UN missions in the framework of the United Nations Interim Force in Lebanon (UNIFIL) in 2010 and has received many awards from the government for his contribution to the development of Bangladesh and for his results in conducting operations against smuggling in the Gulf of Bengal. The Bangladesh Inland Water Transport Authority (BIWTA) is the authority responsible for controlling river transport in Bangladesh. Director of the Pasteur Institute of French Guyana. A doctor specialised in virology, Mirdad Kazanki directed the Pasteur Institute of Bangui in the Central African Republic for 5 years. He is the author of more than a hundred publications in scientific and medical journals on the natural history of viruses, their origins and their transmissions and on public health problems linked to the monitoring and emergence of viral epidemics. The Pasteur Institute of French Guyana is a private foundation recognised as a public utility. It contributes to the prevention and treatment of diseases, mainly infectious, by relying on four components: research, support for public health, education and training, and services. Kabiné Komara has held different posts with the government and with the African Development Bank relating to economic development and international funding. Mr Komara became the Prime Minister of Guinea in December 2008. In March 2010, he became an International Strategy and Investment Consultant for multinational corporations, international institutions and governments. He was elected to the post of High Commissioner of the OMVS on 25 March 2013. Associate professor and researcher at the University of the State of Western Paraná - Unioeste (Brazil); specialist in evaluating the impacts of passes for migrating fish on fish populations. In partnership with hydropower plants (Companhia Energética de São Paulo (CESP) and Neoenergia), Sergio Makrakis evaluates the impacts of hydropower plants on fish. In particular, he was in charge of evaluating the longest fish pass downstream of the Iguaçu falls, and of analysing hydropower feasibility studies on the Mekong River with respect to fish migrations. He has developed partnerships with universities (Department of Hydraulic Energy and Hydrology of the University of Valladolid) and participated in the LIFE Segura Riverlink project sponsored by the European Union. The University of the State of Western Paraná is a Brazilian public university founded in 1988. Its head office is located in the city of Cascavel. Emeritus Professor at the Sorbonne University (Paris VI-Pierre-et-Marie-Curie) and at the Ecole des Mines de Paris, member of the Academy of Sciences. Civil engineer of mines, Ghislain de Marsily obtained his PhD at Paris VI in 1978 and has taught applied geology at the Mines de Paris, then at the University of Paris VI. His field of activity deals with phreatic waters, global water resources, their protection and management, the management of buried wastes, and sustainable development of which water is a fundamental item that affects climate change. He has written many scientific publications. Ghislain de Marsily is also a member of the Academy of Technologies, the French Academy of Agriculture and is a foreign member of the US Academy of Engineering. Since it was founded in 1666, the Academy of Sciences has devoted itself to the development of sciences and advised government authorities regarding them. Director of Water for the State of Geneva, Switzerland. Gille Mulhauser is a biologist-ecologist, who has worked since 1987 on impact studies, wetland ecosystem management and environmental services for agriculture. On 1 January 2000 he was appointed to head the public administration of Geneva responsible for nature and landscape. He now manages a hundred employees responsible for implementing public water policy, and by virtue of this he will chair the operational committee of the international Commission for the Protection of the Water of Lake Geneva (CIPEL) until 2019. The General Water Division (DGEau) is the public authority responsible for managing water resources in the Canton of Geneva (a governmental competence carried out on behalf of the Swiss Confederation). In addition to planning drainage with the municipalities and managing the River Rhone with Services Industriels Genevois, monitoring and action relating to different cycles and resources linked to water is more often performed within a cross-border context (Ain, Haute-Savoie and the Canton of Vaud). Protecting people and property against floods, managing low flows, restoring rivers to their natural states, combating micro-pollutants, ensuring biological corridors and receiving the population on the banks are all ongoing challenges for a city undergoing strong growth. From Senegal, Tamsir Ndiaye graduated as a design engineer with an option in Mining and Geology. He was previously General Director of the Diama Dam Management and Operating Company (SOGED) and Director of the Environment and Sustainable Development with the Senegal River Development Organisation (OMVS). He was in charge of coordinating a large number of projects relating to the management of water use and the impacts of hydropower plants built in the Senegal River basin. He was also the Coordinator of the African Network of Basin Organisations (RAOB) for ten years and a member of the liaison office of the International Network of Basin Organisations (RIOB). The Manantali Energy Management Company (SOGEM) is responsible is responsible for the realisation of Manantali Energy project. The Company is also in charge of operating Félou structures it realised and designing and operating new structures for rural electrification. Economist, writer, member of the French Academy, and specialist in sustainable development, the environment, agriculture and emerging economies. Graduated as an economist, Erik Orsenna was cultural advisor to François Mitterrand, former French President. He is the author of numerous novels (especially “Exposition colonial”, which won the Goncourt prize in 1988) and reference works on globalisation (L’Avenir de l’eau, Voyage aux pays du Coton, Sur la route du papier). Erik Orsenna observes the impacts of economic, social, environmental and geopolitical upheavals, and shows us facets of the new, emerging world. An institution founded in 1635, the French Academy is responsible for defining the French language through the compilation of its dictionary which establishes the proper use of French. Professor at the UACEG, expertise in integrated water management and circular economy in the water sector. Research experience in the areas of water quality modeling, biotechnologies for wastewater treatment, water saving, phosphorus recovery, eco-efficiency and climate change, public participation.Researcher and leader of a number of EU funded international research projects. More than 80 research publications. External expert of the EU Commission and national ministries for project evaluation. Consultant of PM, Rambol, Grontmij, SHER and the World Bank for development and implementation of water related projects. University of architecture, civil engineering and geodezy is a national research and higher education institution, situated in Sofia, Bulgaria. Minister of Agriculture and Rural Facilities of Senegal. Dr Papa Abdoulaye Seck is a specialist in Agricultural Policy and Strategy. He is a member of the Academy of Sciences of Senegal, the African Academy of Sciences and the World Academy of Sciences, agricultural sciences section. Before being appointed Minister of Agriculture and Rural Facilities, Dr Seck was Managing Director of AfricaRice, one of 15 International Agricultural Research Centres (CGIAR). He has been awarded many distinctions (United Nations prize for South-South cooperation, Chevalier de la Légion D’Honneur, Chevalier de l’Ordre du Mérite Agricole de France, etc.) and is the author and co-author of more than 100 publications. The Ministry of Agriculture and Rural Facilities of Senegal is responsible for “Promoting an attractive rural environment and sustainable agriculture, contributing significantly to faster growth to reduce rural poverty”. Hamed Diane Semega became High Commissioner on 19 June 2017. After receiving his MSc in Legal Studies from the University of Bamako, he began his career in the mining sector where he became Administrative Director and then consultant for several international companies, before entering the Malian government as Minister of Mines, Energy and Water (2002-2007) then of Equipment and Transport. He returned to the private sector in 2013 before taking up office as the High Commissioner of the OMVS on 19 June 2017. A Malian citizen, Hamed Diane Semega was born in Dakar, though his ancestry includes branches in Guinea and in Mauritania. The Senegal River Development Organisation (OMVS) was founded in 1972 as the joint management body representing the countries sharing the Senegal basin: Mali, Mauritania, Guinea and Senegal. It has now become a case study for the integrated international management of river resources. Its headquarters are in Dakar. Technical Secretary of Transports and Infrastructure at the Rosario Commodity Exchange (BCR). An economist, Alfredo Sese has worked on the topic of transport for more than 25 years. He has participated in the economic evaluation of using the Carcarañá river as a navigable waterway, and published many articles on transport and other economic problems in several specialised national reviews. The Rosario Commodity Exchange (BCR) is a public entity set up in 1884 in the city of Rosario (Province of Santa Fe in Argentina) located on the Rio Paraná. It is responsible in particular for determining the sale price of cereals on the commodity markets, and is now one of the major actors involved in strengthening the competiveness of the local market and integrating the city in international markets. Former Paraguayan Managing Director of Itaipu Binacional. James Spalding Hellmers held several very important posts in the Paraguayan government. In particular he was Minister of Finance (2002) and Ambassador of the Paraguayan Republic to the United States (2009). He was the Paraguayan Managing Director of Itaipu Binacional, structure managed jointly by Paraguay and Brazil, in charge of managing and operating the Itaipu hydropower plant, from 2013 to 2018. He acts regularly in Paraguay and elsewhere on different subjects such as the impact of the Itaipu dam on the economic and social development of Paraguay, economic globalisation, regionalisation and international relations. A binational structure managed jointly by Paraguay and Brazil, Itaipu Binacional is in charge of managing and operating the Itaipu hydropower plant. Director of International Cooperation of the Yellow River Conservancy Commission of the Ministry of Water Resources, China. Dr. Sun Yangbo is an experienced civil Engineer who has been served for the Yellow River Conservancy Commission for 25 years, specialized in hydrology, water resource planning，environment impact assessment, river basin planning, as well as field experience of hydraulic structure construction. In recent years, Dr. Sun has been leading the international cooperation program in the Yellow River Basin in respect of integrated water resources management, environmental flow and climate change adaptation. He is also the acting secretary general of International Yellow River Forum and the co-leader of the Yellow River Water partnership. The Yellow River Conservancy Commission (YRCC) is a government agency of Ministry of Water Resources of the People’s Republic of China. YRCC takes responsibility of water administration of the Yellow River basin and the inland river basins in such province as Xinjiang, Qinghai, Gansu and Inner Mongolia. Graduated from the Institut d’Etudes Politiques of Paris and the School of International and Public Affairs of Columbia University, Marie-Laure Vercambre has been in charge of the GCI programme on fresh water for eight years. The campaigns and projects she manages in the Green Cross network have confirmed her expertise in issues concerning the development, governance and management of cross-border river basins, and human rights. Founded in 1993 by the Nobel Prize winner Mikhail Gorbatchev, Green Cross International (GCI) is a non-governmental organisation that works globally to tackle all the challenges of security, the eradication of poverty and environmental degradation through advocacy and local projects. GCI’s head office is at Geneva (Switzerland) and it comprises nearly 30 national organisations. 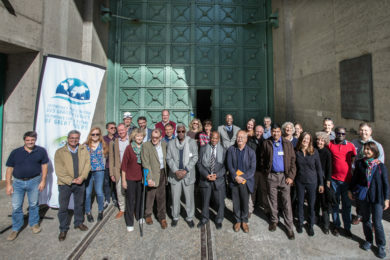 Hello, I invite you to visit the following page, on the Initiatives for the Future of Great Rivers (IFGR) website :Members https://www.initiativesrivers.org/ifgr/members/ Best regards.